I bought Joan Rivers’s 1986 book Enter Talking for $1 in the thrift shoppe of the Stroke Recovering Centre in Palm Springs the day before she nearly died having minor throat surgery. That was over a week ago and she died yesterday. I’ve yet to crack open the book. I’ve always had an affinity for Joan and that affinity multiplied by 10,000 after I watched her 2010 documentary entitled–very fittingly–Joan Rivers: A Piece of Work a few years back on Netflix. As I wrote on Facebook yesterday after waking up in the afternoon and learning of her death, “Joan Rivers truly was a piece of work. This is a still of her from her documentary from a few years back, fittingly entitled ‘Joan Rivers: A Piece of Work’. Behind the outspoken facade was a soft-spoken woman with many emotional scars, who loved her family very much. 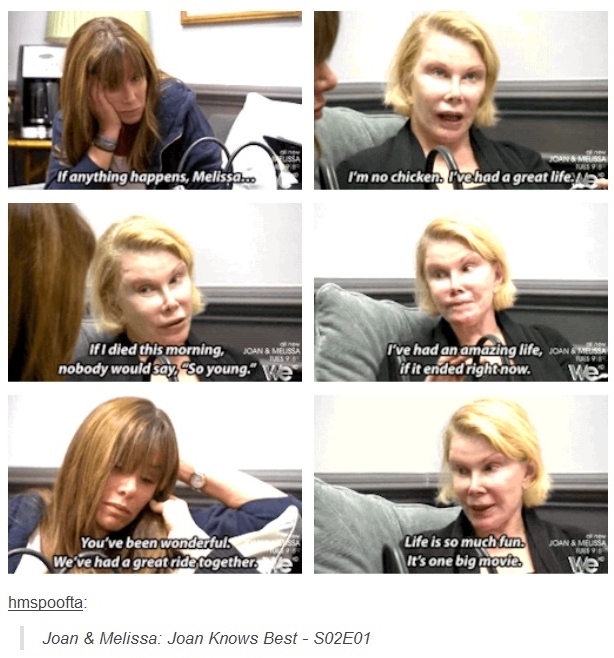 RIP, Joan.” I also found this series of GIFs on Tumblr which I screen capped and shared. It’s a character study of sorts how the death of a celebrity whom you never met strikes a chord with you. When Robin Williams died, I didn’t feel much of anything except a sense of mourning for his family. When Liz Taylor died, she’d been in such pain for so many years that I knew she was relieved to be in a better place. But Joan–oh, lively, vivacious, kicking-and-screaming Joan Rivers–even at 81 she seemed to be taken away entirely too soon. The fact is that if her prognosis had been life in a wheelchair or life without a clear voice, she would not have wanted that. It pains me to type that, but it’s the truth. She died as she lived; keeping everyone on the edge of their seats, waiting to see what would happen next. Rest in peace, Joan Alexandra Molinsky Rosenberg. I hate to tack this on, and I probably shouldn’t. But it was actually going to be my blog this week before Joan died (I really thought she was going to pull through). Clearly the title wouldn’t have been A Piece of Work; even yesterday morning I had been thinking of something along the lines of, These Are a Few of My Eccentricities. But I, too, am a piece of work. I’m never on time for work, as hard as I try. I refuse to text; I can’t be bothered typing on my phone so much. I don’t own a hair dryer (apparently that’s how my hair stays so malleable and soft, per my hair stylist). I keep a plethora of snacks on my bedside table–Kroger-brand Cheez-Its are a staple. I drink straight out of 2-litre Diet Cokes (also Kroger-brand). I don’t use my rear-view mirror whilst driving b/c I don’t trust it (I’d rather crane my neck and look back, even in gridlocked traffic). I don’t ever use sunscreen even though I know I should. I could go on and on, but I’d seem admittedly (more) self-absorbed, especially since this blog isn’t really supposed to be about me, given the circumstances. I’ll end with this: I have a propensity for saying things that perhaps I shouldn’t say out loud. Joan Rivers was very astute at that. It doesn’t make it right, but it makes us both a piece of work. Here’s to you, Joan. And thanks for all the laughs. Here’s a link to her *comeback interview* on the The Tonight Show several months ago, after being banned for 28 years by Johnny Carson and Leno. There’s many other Joan Rivers jokes and quotables which I could share, but I really like the one above which she shared with her daughter about life being a fun movie. (Perhaps I’ll do another blog once I read her book.) So I’ll end here…hope everyone has a great weekend, and thanks as always for reading this piece of work.